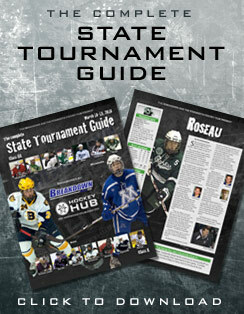 State tournament history hounds might have a problem when it comes to Roseau. The current Rams’ team, which brought the storied program back to the state tournament for a record 33rd time? Or the guys behind the bench, a coaching staff with just as much star power – and state tournament experience? It’s tough to top a coaching staff that is led by Andy Lundbohm (1995), assisted by Dave Bjugson, Scott Oliver, and former NHLers Bryan “Butsy” Erickson (1978) and Aaron Broten (1979), who is also inducted in the U.S. Hockey Hall of Fame. Oliver and Broten have both led Roseau to state berths as head coaches this decade, as well. The former Rams had a bit of advice for the current Rams entering the state tournament. Back in the late 1970s, the Broten and Erickson Roseau team was an overwhelming favorite to win a state title, yet fell shy each of three straight years. They know the underdog can take down the big boys. “They say, ‘When we went down, we were the favorite team. We were on the one who was supposed to win and it didn’t work out that way. You guys aren’t going to be the favorites, but you just have to go down there and play your game and see what happens,’ ” Lundbohm repeated. 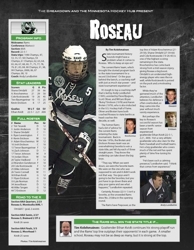 Certainly, Roseau (22-5-1) isn’t a favorite, as the unseeded Rams drew No. 2 Edina in the opening round. 29-50), Shane Omdahl (27-39-66) and Cole Kostrzewski (19-26-45) is one of the highest-scoring remaining in the state. Knochenmus has come back strong from a mid-season injury, giving Roseau a big boost. Omdahl is an underrated high energy player who sees the ice well, while Kostrzewski is poised on the puck and a motivating factor. While they’ve garnered much of the attention, Lundbohm believes his defense is often overlooked, as they came into the year without much varsity experience. But perhaps the key to Roseau’s successful season has been a terrific senior season from experienced goaltender Ethan Kvidt (22-5-1, 2.21, .909). He’s a very athletic goaltender who also stars for the Rams’ baseball and football teams.He’s a big goaltender who covers much of the net and has spent plenty of time fine-tuning his game.